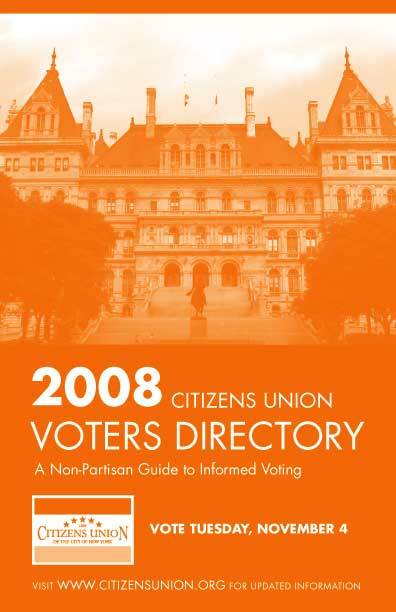 The Citizens Union 2008 General Election Voters Directory is now available. Please click here to download the full directory (3MB). To view a the list of CU Endorsements, please click here (64K). To view our questionnaire and candidate’s responses, please click here (168K). To download borough-specific evaluations, please click below: The Bronx (468K) Brooklyn (636K) Manhattan (468K) Queens (516K) Staten Island (352K) For more voter information and the latest on Ballot Marking Devices (BMDs), please click here.